Miebach likes to collect the data herself, spending hours and days in the field trying to understand complex, dynamic relationships between different variables in an environment. The key, she says, often isn’t to examine the numbers on the instrument — it’s to observe the different things that are going on around you. 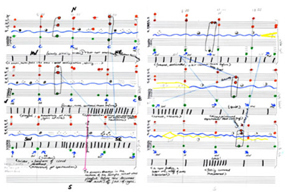 More recently, Miebach has begun turning the data into sheet music too: “These pieces are not only devices that map meteorological conditions of a specific time and place, but are also functional musical scores to be played by musicians. Miebach will be exhibiting her work between now and next year, at various US galleries. It’s also included in a book titled Data Flow 2: Visualizing Information in Graphic Design, available now from Amazon. Carrie Bodle, Sewing Sonifications Performance.